Prescott Ontario’s Canadian Log Home Restoration & Repair has been serving log homeowners in central and northern Ontario for years. Family owned and operated, they provide quality log home restoration and repair work at reasonable prices. 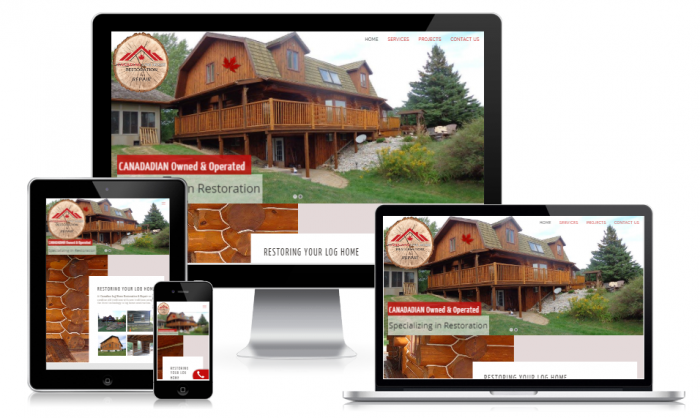 Marcia worked with Kory to create a WordPress website design that conveyed the quality service delivered by Canadian Log Home Restoration & Repair in this very unique – niche home-improvement service. Using a highly visual approach, the Canadian Log Home Restoration & Repair WordPress website provides a before and after experience for the log home restoration. Giving clients a feel for the work done by Canadian Log Home Restoration & Repair. Considering a new website or website redesign for your home services or home repair company? Give us a call to discuss website design options, lead generation, local SEO or anything you’ve considered from an internet marketing point of view but aren’t sure of. We are happy to provide free advice and have a wealth of experience to share. I just had Marcia make me a website all by phone and email and the website turned out better than expected. She is easy to work with, knows what she is doing and is very quick. If you have anymore questions feel free to ask. If you want to view my website the link is below.